I feel so good about crochet right now. I'm crocheting every day and it's all wonderful again. My renewed enthusiasm is all due to Maybelle squares. My recent crochet apathy has gone out the window. I really can't believe how much better I feel! It's like a whole new crafty world when you love what you're doing. I'm sure many of you can attest to this as well: a good project, much like a good book, draws you in and excites you. You don't want to put it down. You can stay immersed for hours without a break. That's how I'm feeling these past few weeks about Maybelle squares. This is the right project for me, at last. I've been waiting for ages to be able to say it. Actually, I'm feeling a serious shift in my mood since I started this project. I was feeling pretty down lately, which is not all that unusual for me, but I was feeling a bit aimless too. I find that having a project gives me a lot of energy and helps me overcome other negative feelings and situations I may be dealing with. Now that I'm working on something again, I feel that sense of purpose and accomplishment. So it's more than just love of yarn and hook - important though they are - motivating me here. That's been a big improvement in my life lately, just like when I started intentional creative work five or six years ago, learning more about crochet, setting my mind to making a big blanket - which turned into many blankets, a fun, rewarding blogging presence, and a strengthened passion for hearth and home. I feel my best when I'm busy, and one of the best ways to be busy, for me, is to be making. My squares will be made with nine center colors of Stylecraft Special DK, on a G/6 hook, and all will be edged in the same color, Grey. 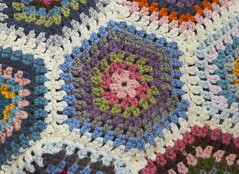 There will be 169 squares, to make a large square blanket that is 13 by 13 squares. Joined, this will give me a blanket of about 90 by 90 inches before crocheting a border. I want this blanket to be pretty huge because it will serve as a top layer on our queen-sized bed during the cold months. I've now completed squares in two of the center colors, Raspberry and Sage. They've been bundled with a strand of yarn and they sit in a grocery bag near my desk. Inelegant, yes, but these are pretty big stacks of squares and they can't just float around the room. Each of these stacks is about six inches tall by six inches wide. They're like fluffy little Nerf balls. One thing I really like about this motif is that while they are flowers, they aren't particularly feminine. If anything, they're geometric. I really like the symmetry of them and the repetitiousness, both in the creation of them and in the way they look when they're complete. I've realized that they remind of the Tudor rose emblem. Do you see it too? Now, I'm working with Parma Violet. I really like the way these look. I feared that this palest of violets would blend right into the Grey, but there's just enough contrast. They look soft and light. I've been making about two squares every day lately. They take about half an hour for me to crochet from start to finish, so they fit nicely into certain "down" times of the day, like when I'm finished with my morning housework but it's too early to do the school pickup, or when I've just put something in the oven for dinner. If I can, I time it to my two daily cups of tea for that perfect sip-and-hook experience. My crochet mojo has been so strong that I've started a crocheted end-of-year gift for the GB's teacher. This is the One-Skein Chevron Scarf by Dina Stelly (Ravelry link), which I've made many times before. It's a delightful, easy pattern which works up quickly and makes a nice gift. I'm using Caron Simply Soft (which is absolutely perfect for this project, a dream to work with, and so soft and silky crocheted up) in Victorian Rose. It's nice to have another chance to make this scarf, especially for someone as lovely as she. What are you working on right now? Do you have the crafty mojo in you? On Tuesday, we were in and out of storms all day long. As you know, I am a pluviophile (love that word! ), or a person who really, really likes rain. Tuesday's weather was a nice change of pace from the sunny, warm weather we've had here for weeks. February, March and April were all fairly dry and the temperatures were mostly above average, day after day. Don't get me wrong - I love beautiful weather too. However, I find it gets kind of boring to have nothing but. So when the weather turns stormy, I'm really happy. I find myself going outside just to look at everything while it's wet, because it really does look different. I especially love to see water on the flowers and leaves. Raindrops on roses, and all that. It was lovely. There was steady rain all morning, then things got more exciting in the afternoon with occasional thunderstorms. In the morning, I stayed home and crocheted, while watching Heir Hunters on Netflix, to which I'm a bit addicted at the moment. It's fascinating. I wonder if it's hard to become a probate researcher...I think I'd be good at it. I'd certainly enjoy being nosy for a purpose. I'm working on my crocheted Maybelle squares right now and loving them so much. I'm making a lot of progress. I think we could be using this blanket by next winter! I don't want to rush but they're so pleasant to make, they almost crochet themselves. It feels so good to have a project I love again. I went so long without a good crochet adventure. Last year without crochet was surprisingly frustrating, though I did complete three large cross-stitch projects. I enjoyed them a lot but I really missed crochet. A rainy morning for quiet crochet was just the ticket after a hectic and stressful couple of weeks. The weather on Tuesday reminded me a lot of the lake-effect storms we had when we lived near Lake Ontario. The rain seemed to come in bands, much like lake-effect snow, interspersed with periods of broken clouds and bright sun. We had two separate thunderstorms, with lightning and small hail, in the afternoon and evening. The sky turned dark and the wind howled. Both storms lasted just a few minutes but they were thrilling. The small Bears and I stopped what we were doing and watched from inside the house. After the first storm, we spent some time in the backyard and let the hens out. It was chilly outside, damp and windy, but the sky was pretty. Before we knew it, the weather turned again and we went back inside. I started dinner - Chicken Pot Pie Soup, an easy favorite we don't have very often but oh so perfect for a stormy day. I sat down with a magazine under the family room skylight just to listen to the raindrops and tiny hail hit the glass. Our soup was delicious. After dinner, I sat looking out the sliding-glass door at rain-soaked flowers, hummingbirds dipping and darting, and the last few raindrops splashing into patio puddles. Have you ever had Chicken Pot Pie Soup? I got this recipe from a friend years ago, one of those concoctions that uses canned condensed soup as a base with lots of fresh ingredients added. I try to cook most meals from scratch, but sometimes this soup is just the thing. It's especially good with a biscuit or bread roll on top, just like a pot pie. On medium heat, brown the chicken in oil in a large stockpot that has a lid, seasoning with pepper and poultry herbs to taste. Remove the chicken to a plate. Add the carrot, celery and potato to the pot. Cook them for 5 minutes until they're just starting to become tender. Remove the vegetables from the pot. Put both soups into the pot, adding cans of water and milk. Whisk the soup and liquid until well-blended and add the chicken and vegetables back into the pot, stirring to combine. Bring the soup to a boil. Reduce heat and let the soup simmer with the lid tilted, stirring occasionally, for about 30 minutes until the vegetables are cooked and the soup is thickened a bit. Stir the frozen peas into the soup about five minutes before serving. Enjoy! *I prefer Campbell's Healthy Request varieties of cream soups, for lower sodium and fat. Hello! It feels like I haven't blogged in a really long time. I've been away from my computer for days. We had a nice Easter, as I hope you did as well, but the following week was pretty challenging as the Bear recovered from his surgery. We went back to the hospital for follow-up appointments and he worked from home a bit, but mostly needed to rest and get better. I was trying to juggle a lot of different things on my own. We both slept poorly at night because he was uncomfortable and keeping me awake. He's doing much better this week and has returned to work and we're both sleeping better, so things are looking up. Thank you for your kind words and get-well wishes, they mean a lot to both of us. This weekend, we tackled some outdoor jobs, which was actually very invigorating. He felt well enough to work for a couple of hours and I was just so glad to be outdoors and getting stuff done. All the perennials are blooming now and it's just lovely to be outside. This time of year is definitely one to savor; the temperatures are usually perfect and the sun isn't too terribly strong yet. In a few weeks, yard work will be a brutal endeavor, but not just yet. I spent an hour or so on Saturday morning weeding the front yard and pulling out volunteer shoots of Russian sage, which pop up all over the yard. Sunday was for the backyard and all four of us worked on getting things ready for the growing season. It's all finished now and I'm really excited to see what unfolds. I planted my annuals, finally. I was itching for weeks to do this, but I held back. I might have done it a bit too early as it is, since the forecast is calling for lows in the upper thirties by the end of this week, but as long as the temperature stays above freezing, I think it will be okay. Anyway, I've really refined my annuals game over the past few years, after planting too much in the past, and now I'm down to just my half-barrel and this small Talavera planter, and I feel hopeful that I can have good annuals all summer long. Last year, I planted beautiful lavender-and-yellow violas in the Talavera pot but they couldn't handle much sun and they died by early June. This year, I deliberately chose plants that want long periods of direct sun. I really love this planter and I want something to survive in it! I chose two small celosia plants, a pink and an orange. Celosia thrives with 6 or more hours of full sun, and I'm only hoping that New Mexico-strength sun has been accounted for. It's a small, lightweight pot, so I can always move it into shade if it seems like they've had enough. In the barrel, I planted five geraniums. I have had geraniums in the barrel for years, but I've always added other plants, such as lobelia or verbena, for color and design, but I don't think I'll bother with anything but geraniums anymore. I ended up pulling four out of six verbenas last year because they were too crowded. The back of the barrel is in partial shade so things don't grow as well there. So just geraniums now. I planted them closer to the front of the barrel to give them more sun exposure. I know they'll do well here and I'm glad I resisted the temptation to fill up the barrel with other things that will only look nice for a little while. It's a terrible feeling to throw away plants, isn't it? All that water wasted. I tried to go with a theme with my flowers this year, sticking with pinks and oranges. I thought it would be nice with the new house paint. The barrel has two fuchsia geraniums on the left, a peachy-pink in the middle and two orange ones at the right. I was thinking about kind of a wave through the colors, which works in my head, but we'll see. Less beautifully, we planted our vegetable containers too. I don't remember exactly what is in which container at the moment, but they include two kinds of tomatoes, cucumbers, zucchini and yellow squash. They'll live here on the west wall of the yard, near the chicken coop, where they'll get good but not terribly intense sun. Other things are planted in the side yard, along the house. We have two kinds of grapes back here and they're doing really well. We also have an outrageous amount of tarragon back here that I'm always looking for ways to use. Annual-wise, we plant tomatoes and herbs over here. We have a large planter with basil, chives and thyme this year. We try different herbs every year, but there is always basil. This post is mostly about the back yard but I am so excited about this Spanish lavender we planted in the front about eighteen months ago. We planted an English lavender at the same time, to replace a big, old one which had died. Neither new lavender did much in their first spring, last year, but this year the Spanish has bloomed so nicely! The new English has buds (as does the other old one we still have) so I think it will flower soon too. The front yard smells better and better every time I go outside! Back to the back...I bought a new patio umbrella this spring. It's from Target and I took advantage of a big patio sale with an extra discount coupon code. Our old umbrella was in sorry shape and I really wanted a bigger one anyway, so it was a good time to grab a new one while they were cheaper. I chose a neutral color to blend with the house and let the flower colors stand out. It's just lovely. We've eaten lunch out there almost every day for the past couple of weeks. I also sprung for a concrete base for the umbrella. I've never had one before; I always took the old umbrella down and put it away on the porch to keep it from blowing away. It turns out you don't have to do that if you have a base! Duh. I don't know why I never thought of buying one but it makes a big difference. And check this out - the new umbrella tilts! I know, this is probably really old "technology" but the old one didn't have this feature and I was constantly moving the umbrella around and sticking it back into the table at different angles to block the sun. But not anymore, now that I've leapt so proudly into the um...twentieth century. Look what I found while I was gardening! We're not sure where the nest is, but we all marveled at the idea of a baby robin who was small enough to hatch from that little hole. And we all agreed that baby birds and teeny eggs are some of the nicest things about springtime. I just wanted to say hello and welcome to new readers and followers! I've noticed several new commenters lately and I am really glad you're here. I hope you'll enjoy following along with our homey adventures. I've had some questions about the Winter Project Link Party lately and I thought I'd address them here; the party will resume in October, provided there is interest among my readers. I will ask about interest toward the end of summer, probably in August, just to see whether people wish to participate again. It only takes a few to have a nice link party. I hope that if you're interested now, you'll keep my party in mind come the fall. I'd love to have you! I've been trying for over a year to decide on a blanket design; I want a new afghan for our queen-sized bed, to use with the duvet in cooler weather. 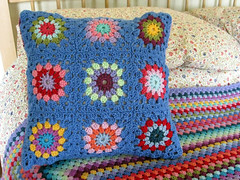 I made a giant granny square blanket for our bed several years ago and we like it, but it would be nice to have something new. The "giant" granny square isn't as big as we'd like, in spite of its name. And I'm better at crochet now, so I wanted to try a more complex design. Choosing one has been so hard. I knew I didn't want stripes or ripples for such a large bed blanket. I wanted individual squares. I tried close to a dozen different kinds of squares and hexagons, but nothing felt right. I think I've finally figured out what was giving me so much trouble, and it's a huge relief. This may sound silly but my problem was color: I was using too many colors and everything was looking very busy. I was having trouble making pleasing combinations with so many colors in the mix. I kept seeing "gaps" in my color palette, and every time I added a new color, I'd have to add one or two more to balance it out. It was getting out of control. Most recently, when I thought I had found the key in Sunburst squares, which I really do love and enjoyed making, I was up to something like 24 shades. I started joining them and they looked terrible. The colors bothered me. I thought I wanted another blanket like the GB's Ice Cream Flowers, only with gray instead of white. Her blanket is lovely, but...well, it's a little girl's blanket. I'm happy with it, and it works really well in her sunny, colorful bedroom, but it's not right for our room. I want something quieter and calmer, more grown-up. I also want a project I can handle. Some people are good at wrangling huge color assortments into a visually-pleasing creation. Some are really good at limiting themselves to a small color selection and methodically planning where colors should go. Some people can do both, which amazes me. I can make a detailed plan, but it's hard for me to execute. I don't like total randomness either, so I feel stuck sometimes. I think it's why I usually fall back on stripes or ripples. They make more sense from a color-theory standpoint, for me. Some colors look bad together, so you don't make adjacent stripes with them. Simple. Squares with multiple-round motifs confuse me, color-wise. What I wanted, I slowly began to understand, was a square design that didn't rely on multiple colors. I thought about solid one-color grannies but those seemed very plain. Then I remembered how much I enjoyed making Maybelle Squares in the past. I'd only ever made them as decorations (I made a garland of squares as a blog giveaway prize several years ago, and a garland of the inner flowers without the square rounds for the GB's room). I liked making them, though, and I really enjoyed the blanket projects I'd seen made with the pattern, which is a joint effort between one crochet blogger, from the blog 6ichthusfish (sorry, but I don't know this lady's name), who designed the flower and another, Annette, of the blog My Rose Valley, who designed the squaring part. Annette has made beautiful blankets with the square she designed, and I've always thought I'd like to try making a pillow cover or throw with her squares. Last year, she made a baby blanket with her squares that I really admired. It occurred to me that Maybelle squares fit all my criteria for our new blanket: fairly large squares (about 6 inches across in DK yarn), one color for the flower and one for the squaring rounds, easily joined (I usually prefer joining-as-I-go and may do that here). Most importantly, it's pretty but simple. I remembered that I'd already been thinking somewhat along these lines last fall, when I came up with a plan for large hexagons made in various color gradients using nine colors of yarn, joined with gray. I lost interest in the hexagons, but I still liked the colors very much. I knew I would do better with fewer colors, which is why I wanted to do the hexes in just such a way, and it occurred to me that I could use those colors for Maybelles instead! Annette's baby blanket uses five colors squared with cream and joined with beige. I love the look but I wanted to stick with gray for our blanket. I think the gray offsets the femininity of the flower motif. My nine colors of Stylecraft Special DK are in the basket above. Clockwise from top: Denim, Grape, Raspberry, Duck Egg, Petrol, Pale Rose, Sage, Storm, with Gray and Parma Violet in the center. I worked out the numbers for my blanket and started crocheting. Most of the colors will require 19 squares and a couple of them (Raspberry and Petrol) will require 18. I finished all the Raspberry ones already. I looped a piece of yarn through the centers to keep the pile together. Then I started the Sage ones. I think Sage is my favorite color of Stylecraft Special DK right now. I just love its retro look; I think it has sort of a 50's feel. In fact, I think the whole color palette does. I like the slightly washed-out look of these colors with the gray. I know I keep saying I feel good about various blanket projects, but I really do think this one is right. I honestly love making these squares. 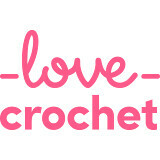 They make me feel like I did when I first started crocheting seriously five years ago. It's that kind of design, I guess. I find it exciting and calming at the same time. The pattern is easy to memorize and they make up quickly. I can work on them while I do other things. I think this is going to check all my blanket boxes. Finally, a blanket! Every time I think spring is really here - finally - to stay for good, the weather gods laugh. They must be rolling in aisles up there. Oh, so you put away the winter pajamas? Tee-hee! You wore flip-flops to the grocery store? You're so cute. You want to use the screen in that new door? Here's some wind and snow! That's early spring around here, though. It can be eighty degrees without a cloud in the sky one day and then you wake up the next morning to slushy rain. The furnace doesn't run for an entire week and next thing you know, it's on all day long. We've had another round of colds over the past week and I blame the weather. Nobody can figure out how to dress. And people do crazy things, assuming that one warm day is all it takes and now it's just spring forever. I saw some kids using a Slip 'N Slide a couple of weeks ago! It really wasn't warm enough that day and I'm not just being a curmudgeon. My own two watched longingly and made noises about wanting to join them or get their own, but I shut it down fast: we don't know those kids, and we don't have a slope in our yard. I didn't say Only dummies use a Slip 'N Slide in this kind of weather. But I was thinking it. In spite of the meteorological roller-coaster, all the plants are blooming nicely. We have a few iris buds here and there; I think there will be flowers sometime next week. The apple tree bloomed rather pitifully this year. We won't have many apples but the flowers looked nice while they lasted. The birdbath and hummingbird feeders are out again. After severely pruning the vines over the courtyard last fall, we've had a lot more wisteria in bloom this spring than I can ever remember before. Maybe it was being choked by the trumpet vine it's intertwined with up there. There's nothing like blooming wisteria directly outside your front door. I want to walk out the door a hundred times a day just to have it hit me as I step onto the mat. As it is, I find a lot of unnecessary excuses to go out that way. I could get the mail and the UPS packages in one trip, but I treat myself to two - wisteria is worth it. I will never stop feeling grateful to the couple who owned this house before we did. They were very talented gardeners and we're still reaping the rewards eight years on. Our evening garage-biking program continues. We did this all winter and now we're getting close to the time of year when we can open the garage door while we ride. We're going to look ridiculous, but we're exercising and that's a good thing. I do feel healthier. I'm less tired during the day, for one thing. I've never been an enthusiastic exerciser but I've always loved that feeling when you're finished. If I could make myself feel that way before I started, that would be awesome. Then I'd never want to stop. Instead, I try to relish the great feeling after I've taken a shower and am sitting down with a book or watching TV. That's a great feeling. It sounds really lazy, and to be fair, I am pretty lazy. You know what I mean, though. I love that "being done" feeling. We're getting ready for Easter. I wish we had a bit more time off for the holiday but we're in full-steam mode now, finishing up the school year. I think we have about six weeks left. I've got the Easter menu planned and will finish shopping this week. It will be weird holiday weekend because the Bear is having his knee surgery, finally, on Friday morning. There's no school, and I don't have childcare help, so the small Bears will be at the hospital with me. I plan to pack a lot of activities and snacks. We'll take a walk around the building. It's outpatient surgery and isn't supposed to take all that long, so we'll make the best of it. The LB had his surgery in the same hospital two years ago and he knows all about the Subway in the lobby, so maybe I'll spring for lunch. You can keep kids quiet for a while with a Footlong. Everything is ready for the surgery; we borrowed a set of crutches, we bought a new ice pack and we added a lot of new things to our Netflix streaming queue. Wish us luck. I'll be back soon to tell you all about the latest incarnation of my Never-Ending Blanket Project. I know I've waxed poetic about approximately 15 different ideas over the last year, but hear me out. I've cried wolf an awful lot, but I finally feel like I'm doing the right thing. Life lately has been a bit of a blur. We're just about finished with the home-improvement projects which have consumed us (I'm not kidding) for a couple of months. There was so much we wanted to do and we needed to get it done between the really cold season and the really hot one, and let's face it, that's not a long time. Spring and fall are short here and we spend both seasons scrambling to finish projects that we can't do in winter or summer. We've reached a stopping point now, which is nice. We hung our new storm door this weekend. I am so happy with it! The whole room looks more finished. I've been kind of obsessive about keeping the glass clean on both doors, inner and outer. As soon as I see a fingerprint, I'm running for the Windex. I don't think this level of fastidiousness can last but right now I'm just so darn excited about this door. What a dork. A door-dork. I've been missing this space a lot. I haven't had much time lately for blogging, but it's just that time of year. The big school projects are behind us, thankfully, but now there's testing and the class plays have started rehearsing. The LB is playing Doctor Craven in his class production of The Secret Garden, and the GB is playing the West Witch in The Wizard of Oz. I've been working on their costumes. The GB's dance school has their biennial recital at the end of May. It's held in a theater on the university campus and it's a very big deal. Her costume is just beautiful, a long dress with a red velour leotard-bodice and full pink tulle skirt with red satin trim along the bottom edge. Her class is dancing to "Reflections" from the Disney movie Mulan. She'll also have a guitar recital. So much to do! They're having fun, which is the most important thing. I've been looking ahead to summer break too; both will be signed up for swimming lessons again (the LB is almost finished and can take diving lessons soon!) and I've booked a camping weekend already and I'm looking for one more. Whew. These past few days have been pretty chicken-centric as we get the new girls acclimated to life in the coop with Betty. We took it slow, first putting them in enclosures near each other, then letting them free-range together in the backyard. Eventually, we closed them in the coop together and stood back. Betty was a little bossy at first. Each chick got a little peck on the beak and they spent the first day huddled in a corner of the run while she patrolled the area near the food and water. Then the chicks discovered the ramp into the "apartment" section of the coop and hightailed it inside. But they all slept together peaceably in the apartment that night and everything seems fine since. Betty lets them eat and drink and hasn't pecked them again. They still stick together but I think they'll mingle more when they're bigger. Big Betty is dominant for now, but it may not last; the new Ginger is already looking pretty brawny. They have names now, by the way. The small Bears named them, overriding my old-lady name suggestions. The Buff Orpington is Ginger, like her surprise-rooster predecessor, and the New Hampshires are Latte and Caramel. I can't really tell those two apart, but I'm told Latte has more white on her wings, hence her milky moniker. It's fine, but I was holding out for Gladys and Harriet, in case you're wondering. Thanks for your sweet comments lately. I hope you're doing well and enjoying a taste of spring (or autumn!) wherever you are.